For many travelers booking a trip to Thailand, one of the biggest draws is the cuisine. Thai food is renowned all around the world and is known for its fresh and bright ingredients paired with a lively spiciness that really gives the food personality. One of the most popular dishes in Thailand is curry, in fact, Thai Massaman curry ranked 10th on CNN’s “World’s 50 Best Foods” in 2017. Thai curry is often something that people enjoy while visiting the country, and then go home and try their best to replicate it. If you’re looking to experience Thailand’s curries while in the country, then this guide to all things curry can prove to be invaluable. Rather than just enjoy the curry while you’re in Thailand and then go home with nothing other than sweet memories, why not book a cooking class and learn in an authentic setting? Mama Noi Thai Cookery School offers an in-depth Chiang Mai cooking class farm-based experience where you’ll get to learn in a private setting. The goal is to teach students about the art of Thai cuisine, as well as how to make the dishes nutritious and healthy. The beauty in attending a cooking class is that you’ll learn a new appreciation of Thai cooking, in particular, curry, and then you’ll be able to go home and give it a try. Another thing to be aware of is that curry isn’t just one dish, in fact, there are all kinds of different types of Thai curry. Each has its own unique flavors and ingredients and can be enjoyed with specific dishes. As well, they tend to be found in specific areas of the country, so depending on where you are staying in Thailand, one will be much more prevalent than the others. Penang curry is found in central Thailand and is ideal for those who don’t want something too spicy. 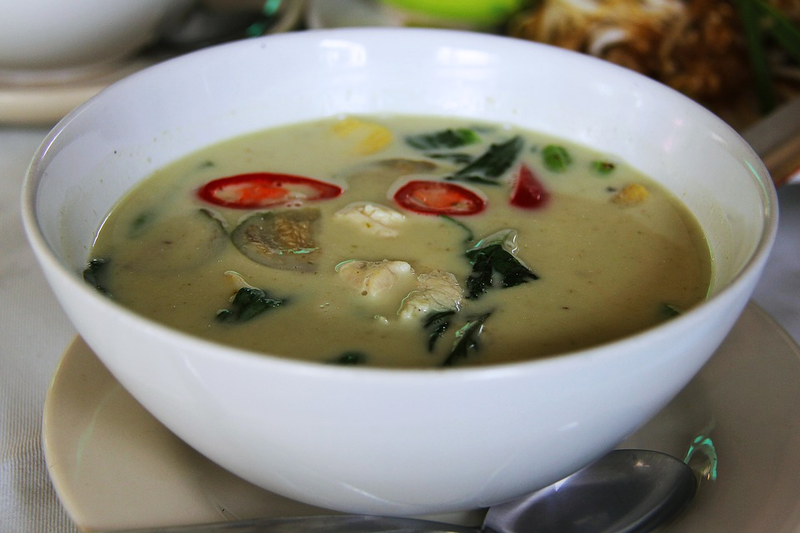 It uses dried chilies, coconut milk, blue ginger, cumin, cilantro, lemongrass, and kaffir lime. Found in central and southern Thailand, this curry actually comes from an Indian curry. It not only includes all the staples of curry but potatoes and peanuts as well. Yellow curry is among the most common in Thailand and can be found throughout the country with slight variations. It may or may not have coconut milk in it, is spicy, and can also have a bit of a sour taste. This one is most commonly found in central Thailand and is meant for those who can handle the heat. Of all the curries, sweet green curry is the spiciest. Key ingredients include green chilies, coconut milk, lime juice, Thai basil, garlic, shallots, turmeric, and shallots just to name a few. This one is also native to central Thailand and instead of green chilies, it uses red chilies. As you can imagine, it is also very spicy and features such ingredients as blue ginger, garlic, shallots, and lemongrass. It is typically served over vegetables and/or meat. All that’s left for you to do is start sampling all the various curries.